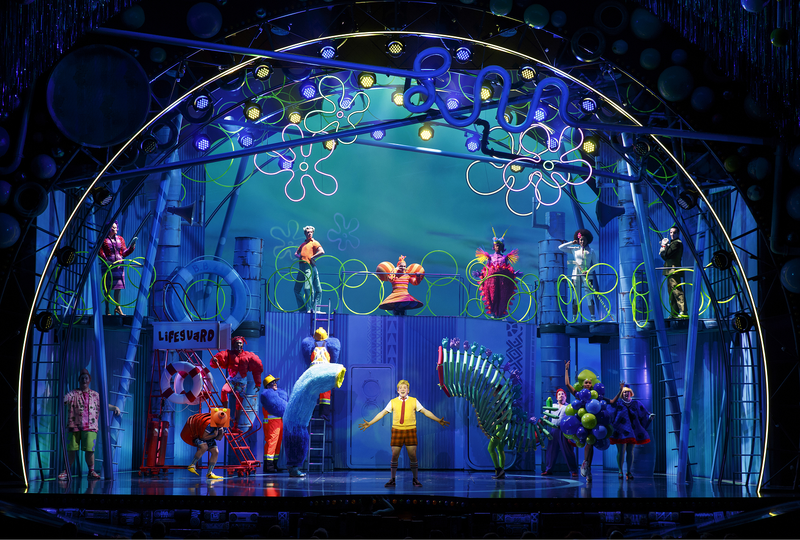 Bikini Bottom has arrived on Broadway. Opening Monday, SpongeBob SquarePants: The Broadway Musical boasts songs by John Legend, Cyndi Lauper, David Bowie and other heavy hitters, plus a number by a writing team most have never heard of: Andy Paley and Tom Kenny. Turns out Kenny, 55, has voiced SpongeBob since the animated series' 1999 Nickelodeon debut. “It’s not like SpongeBob was handed off to a bunch of people, ‘Here, raise this baby,’ ” Kenny tells The New York Post, saying he and others on the TV show had a hand in the musical. Here’s what else he told The Post about life in a pineapple under the sea. What was it like getting cast as a sponge? When did you first see the character? [Creator Steve Hillenburg] took out his pitch bible for SpongeBob, which had drawings and personality paragraphs — personality breakdowns of the characters — and explained the show to me, and he said, “I’d like you play to SpongeBob. This guy.” It’s weird. I’m not a mystical person or a spiritual person at all, but I gotta say, I fell in love with it immediately. I don’t really think I’d had that feeling before, or since. What’s it like keeping the show going? One thing that I think has helped the SpongeBob franchise live is that the people that make the show are a pretty small group still. We recorded an episode yesterday, and I was like “Man, 20 years I’ve been going to work with these people!” We’re yucking it up and laughing, talking about each other’s kids. What’s it like to watch another guy play SpongeBob? Ever since I saw a preview of the show in Summer 2016 in Chicago, people have gone, “Wow! Is it weird for you to watch somebody else play SpongeBob?” And I’m like, I’m surprised at how not-weird it felt. I’m pretty possessive about SpongeBob. He’s my guy. [But] I realized that we’d done CGI versions of SpongeBob, stop-motion versions of SpongeBob. There’s theme park versions of SpongeBob who walk around in costumes. This is just the newest way to see SpongeBob. SpongeBob SquarePants begun Broadway previews Monday, November 6th at the Palace Theatre on New York City's prestigious Broadway, before officially opening on Monday, December 4th. To purchase tickets the SpongeBob SquarePants Broadway musical, visit SpongeBobBroadway.com, Ticketmaster.com or call 877-250-2929. More Nick: Are You Ready Kids? SPONGEBOB SQUAREPANTS Musical Begins Broadway Previews Monday; New Block Of Tickets Available! Lots of kids dream about starring on Nickelodeon. Nick is home to some the best TV shows to ever be created and once you’re part of Nick, you’ll always be part of the family. To find out what its like to be part of the Nick fam, Clevver recently talked with Lizzy Greene and got the 4-1-1 on all things Nickelodeon! You probably recognize Lizzy as Dawn on Nicky, Ricky, Dicky & Dawn, but her new holiday movie, Tiny Christmas, is about to be on your must-watch list. Lizzy spilled on everything from what it was like to get into the Christmas spirit, why there were horse problems and why she didn’t even have to audition for the movie. After reading this, Lizzy is sure to become one of your new favorite actors! Clevver first had to ask Lizzy what being part of the Nick family really meant, and you’ll be happy to know it’s just as amazing as it seems! What’s even more brilliant is that being part of Nickelodeon family is what helped her land her first movie deal! How fantastic is that? Almost immediately after being offered the role, Lizzy knew that she had to accept. Tiny Christmas is about Barkley and her cousin, Emma, played by Henry Danger's Riele Downs, and how when one of Santa’s elves accidentally shrinks them, they must embark on a epic journey to unshrink themselves or else they will be tiny… forever! Although they filmed this movie in the spring, they were in Canada and had no trouble getting into the Christmas spirit. NickALive! totally agrees with Lizzy’s holiday sentiments, and seriously cannot wait to see this movie. It’s going to be even better knowing about what was really happening behind the camera while they were filming. Most actors would probably find it hard to film with crazy horses, but thankfully Lizzy and Riele are total professionals and finished filming the movie as best friends. When two actors are friends both on screen and IRL, it makes the movie even better, which is why fans can’t wait to see this movie! Make sure to tune into Tiny Christmas, when it debuts on Nickelodeon USA on Saturday, December 2nd at 8:00pm ET/PT, and soon after on Nickelodeon channels and blocks around the world! In an interview, star Lizzy Greene talks about her favorite music, her role models and life on the TV set. We were able to preview the new Nickelodeon movie “Tiny Christmas,” which stars one of our favorite Nick actresses, Lizzy Greene. We think you should watch “Tiny Christmas” because it is super funny. We loved the part when Barkley (played by Lizzy) and Emma (Riele Downs) got shrunk by the elf. Our favorite part was when the neighbor found Emma and Barkley on the chocolate and freaked out. It was really funny when the neighbor saw the word “HELP” on the floor and thought the cat did it. We wondered how it felt to be tiny. Another good part was when Barkley slid into Emma’s bed like a snake, then started playing music, then started burping songs. We really liked it when Barkley was running away from the cat and hid in the wrapping paper roll. Oh, we almost forgot about the cat! You should have seen the cat — he was rocking his Christmas outfit. If you are looking for a funny Christmas movie, “Tiny Christmas” is the movie for you. She was really nice and friendly because we got to take pictures with her and we even got her autograph. She even let us take as many pictures as we wanted! We found out that Lizzy loves to dance and sing. Her favorite type of music is hip-hop music, and she loves to listen to Taylor Swift. Scary books and movies are her favorite because she said they make her feel as if she is always at the edge of her seat. We got to ask her many questions — a lot of them made Lizzy laugh. We asked Lizzy what it was like to film the burping scenes in her new movie, “Tiny Christmas.” We also asked her about school, and she said biology was a hard subject for her because it was totally different from the other sciences she learned. We also asked her if she misses home-cooked meals or if she prefers to go out. She said she likes them both and loves to go out for sushi. She told us that she works long hours on the set of her show — about nine hours a day. She said she reads her lines every morning to help memorize them. She even looks into the mirror to help. Lucky for her, she can memorize her lines very quickly. Some of the things she does in her free time is watching YouTube, going to the mall with her friends, going to trampoline parks and relaxing. One of the people she admires is Ellen DeGeneres from “The Ellen DeGeneres Show.” Two others are the actors who play the parents in “Nicky, Ricky, Dicky & Dawn,” Brian Stepanek (Tom) and Allison Munn (Anne). She gave us great advice about life. She told us to always work hard to accomplish your dreams. It was a really fun and memorable day. More Nick: Nickelodeon USA's December 2017 Premiere Highlights | Holidays | Nickmas! Follow NickALive! on Twitter, Tumblr, Google+, via RSS, on Instagram, and/or Facebook for the latest Holidays on Nickelodeon and Tiny Christmas News and Highlights! Social video creation platform Wochit today announced that Viacom International Media Networks (VIMN) Southern and Western Europe, Middle East and Africa cluster has selected the company’s cloud-based toolset for implementation across brands in eight markets. Enhancing VIMN’s aggressive social video strategy, the deal gives the network’s brands and editorial teams greater ability to rapidly produce engaging content optimized for distribution on social and owned-and-operated properties. In addition to speed and scale, Wochit brings Viacom brands such as MTV, Comedy Central, Nickelodeon and BET the ability to collaborate with ease. Teams from all of the Viacom properties can share, view and edit content created by journalists and video teams any part of the network, all from a single dashboard. The platform also supports automatic rebranding of videos, which further speeds production, and offers greater insight into performance through real-time monitoring capabilities and rich data reporting. Wochit is a video creation platform that empowers newsrooms, media companies and brands to expand audience engagement through the power of social video. Worldwide media brands such as Time Inc., CBS, USA Today, Gannett, Condé Nast, The Week, ProSieben, Singapore Straits Times, and Der Spiegel use Wochit to produce short-form videos around trending topics at the scale and speed required in the video-first, mobile era. With rights-cleared assets from AFP, Reuters, Getty, and others, cloud-based editing tools and native uploads, horizontal and vertical videos are quickly created and distributed across all social and digital platforms. Wochit is among the 2016-2017 EContent Top 100 companies in the digital content industry as well as the the winner of both the Gutenberg Prize for its disruptive technology in the field of journalism and Digiday’s Best Video Technology Innovation for its significant impact on publishers’ bottom line. The Company is backed by ProSieben, Singapore Press Holdings’ SPH Media Fund, Carlo de Benedetti, Redpoint Ventures, Marker LLC, Greycroft Partners, Cedar Fund, and Press Association. Wochit is based in New York, with offices in London and Tel Aviv. Find out more at http://www.wochit.com. Today we are thrilled to announce that Viacom International Media Networks (VIMN) Southern and Western Europe, Middle East and Africa cluster has chosen Wochit for its social video production needs across brands in eight markets. Enhancing VIMN’s aggressive social video strategy, Wochit gives the network’s brands and editorial teams greater ability to rapidly produce engaging content optimized for distribution on social and owned-and-operated properties. VIMN’s cluster portfolio is comprised of many of the world’s most popular multimedia entertainment brands, including MTV, Nickelodeon, Comedy Central, Paramount Channel, Spike, BET, VIVA, Game One and J One and spans Spain, France, Italy, Portugal, Greece, Benelux, Germany, Switzerland, Austria, Africa, Middle East, Malta and Turkey. Viacom brands are seen across the cluster in 229 million households via more than 60 channels and more than 20 brands. In addition to speed and scale, Wochit brings Viacom’s brands the ability to collaborate with ease. Teams from all of the Viacom properties can share, view and edit content created by journalists and video teams any part of the network, all from a single dashboard. Automatic rebranding of videos further speeds production, and offers greater insight into performance through real-time monitoring capabilities and rich data reporting. We look forward to all the incredible videos to come from Viacom’s numerous properties! H/T: Rapid TV News; Additional source: TVBEurope. TORONTO, Nov. 29, 2017 /CNW/ - Spin Master Corp. (TSX:TOY; www.spinmaster.com), a leading global children's entertainment company continues to inspire change this holiday season through the Spin Master led global initiative, the Toy Movement (www.thetoymovement.org). Formed in 2014, the Toy Movement has completed missions in Mexico, Israel, Jordan and Turkey. Together with Play Africa (www.playafrica.org.za/), 45,000 toys will be delivered to children in need within South Africa this holiday season. In an effort to continue to bring joy to children worldwide, Spin Master will be holding a special event on December 1, 2017 to coincide with World Aids Day at the Woman's Goal on Constitutional Hill. In partnership with Play Africa, and with support from Just Fun (Pty) Ltd, Nickelodeon South Africa, and Ty Inc., children will receive toys, meals and enjoy live entertainment. "Spin Master's vision is to make life more fun, and based on our position in the toy industry we feel it's our responsibility to help children in need," said Mark Segal, Spin Master's Executive Vice President Finance and Chief Financial Officer. "The Toy Movement has the goal of bringing inspiration and the opportunity to learn, grow and play to children living in challenging situations and that's what we hope to inspire. Many of us have roots in South Africa, so this is a particularly gratifying initiative." "Play Africa champions every child's right to play, and by partnering with Spin Master's Toy Movement, we're able help bring joy to children and their families this festive season," said Play Africa CEO Gretchen Wilson-Prangley. "South Africa faces enormous challenges when it comes to providing our children with safe play areas and early learning tools, such as toys. In partnering with Spin Master, we aim to celebrate and encourage the transformative power of play." The event on December 1, 2017 will be followed by the distribution of approximately 45,000 toys to various schools, orphanages and day care centers for under privileged children in South Africa. The Toy Movement (www.thetoymovement.org) is a Spin Master led, global initiative to ensure that all children have the opportunity to be a child and to be inspired through play. Formed in December 2014, The Toy Movement's mission is simple: to deliver inspiration, imagination, and joy to children living in troubled parts of the world. The Toy Movement aims to show these children that they are not alone, that they are not forgotten, and that they deserve to play, learn, and grow – as all children should. Learn more at TheToyMovement.org. Spin Master (TSX:TOY; www.spinmaster.com) is a leading global children's entertainment company that creates, designs, manufactures, licenses and markets a diversified portfolio of innovative toys, games, products and entertainment properties. Spin Master is best known for award-winning brands including Zoomer®, Bakugan®, Meccano®, and 2017 Toys of the Year, Hatchimals®, Air Hogs® and PAW Patrol®. Since 2005, Spin Master has received 92 TIA Toy of The Year (TOTY) nominations with 21 wins across a variety of product categories, including 13 TOTY nominations for Innovative Toy of the Year, more than any of its competitors. To date, Spin Master has produced six television series, including 2007 success Bakugan Battle Brawlers and current hit PAW Patrol, which is broadcast in over 160 countries and territories globally. Spin Master employs over 1,500 people globally with offices in Canada, United States, Mexico, France, Italy, United Kingdom, Slovakia, Poland, Germany, Sweden, the Netherlands, China, Hong Kong, Japan, Vietnam and Australia. More Nick: Spin Master Considering Making A 'PAW Patrol' Feature Film! Follow NickALive! on Twitter, Tumblr, Google+, via RSS, on Instagram, and/or Facebook for the latest Nickelodeon Africa News and Highlights! Nicktoons USA, Nickelodeon USA's animation and action channel, will be premiering the remaining nine episodes of the second season of Harvey Beaks daily over two weeks from Monday 18th December 2017 at 8:30pm ET/PT! Originally posted: Thursday, November 23, 2017. Original source: Nick and More (II, III), TheFutonCritic.com; H/T: ToonZone Forums /@NeoplanDan, PinkiePie97; Additional sources: Wikipedia, Zap2it TV Listings. Follow NickALive! on Twitter, Tumblr, Google+, via RSS, on Instagram, and/or Facebook for the latest Holidays on Nickelodeon and Harvey Beaks News and Highlights! Nickelodeon USA will be treating fans of the networks popular animated series Bunsen Is a Beast to a monsteriffic gift this festive season with the premiere more brand-new episodes of Bunsen Is a Beast daily from Monday 18th December 2017 at 8:00pm ET/PT! More Nick: Nicktoons USA To Premiere Remaining Episodes Of 'Harvey Beaks' From Monday 18th December 2017! Sources: Zap2it TV Listings, Nick and More, TheFutonCritic.com; H/T: ToonZone Forums /@NeoplanDan, /@PinkiePie97. Follow NickALive! on Twitter, Tumblr, Google+, via RSS, on Instagram, and/or Facebook for the latest Holidays on Nickelodeon and Bunsen Is a Beast News and Highlights! Nickelodeon USA will be treating fans of the networks popular animated series Bunsen Is a Beast to a monsteriffic Christmas gift with the brand-new Bunsen Is a Beast Christmas special, "Bunsen Saves Christmas", premiering Monday 18th December 2017! Update (11/30): Nickelodeon has postponed the premiere of the networks Bunsen Is a Beast Christmas special, and will now air "Bunsen Saves Christmas" on Monday 18th December 2017 TX channel and time TBA. In the brand-new Bunsen Is a Beast holiday special, "Bunsen Saves Christmas", Bunsen becomes excited about celebrating his first Christmas! Meanwhile, when Amanda finds out she's on the naughty list, she stuffs Santa in a gift box and hijacks all the toys! The voice cast of Bunsen is a Beast includes: Jeremy Rowley (iCarly) as Bunsen, the first beast ever to attend a middle school for human kids; Ben Giroux (Henry Danger) as Mikey, a sweet and quirky kid and Bunsen’s best friend; Cristina Milizia (Monster High) as Darcy, Bunsen and Mikey's homeschooled friend; Kari Wahlgren (The Fairly OddParents) as Amanda Killman, the rigid and rule bound beast hater; comedy legend Cheri Oteri (Saturday Night Live) as Miss Flap, Mikey and Bunsen's eccentric teacher; Jeff Bennett (Jake and the Neverland Pirates) as Bunsen's Dad; and Jennifer Hale (The Powerpuff Girls) as Bunsen's Mom. Additionally, Wahlgren and Rowley also voice Mikey's Mom and Dad. Originally posted: Thursday, October 26, 2017. More Nick: Nickelodeon USA's November 2017 Premiere Highlights | Thanksgiving | Nicksgiving! Source: Zap2it TV Listings; H/T: ToonZone Forums /@Candy Randy, /@PinkiePie97. Multi Channel Network (MCN), Australia's most progressive media advertising company, recently chatted to Vanessa Winley, the director of Ad Sales and Brand Partnerships at Viacom International Media Networks (VIMN) Australia & New Zealand, on the success of Nickelodeon in 2017, and what's in store for 2018 - including a third season of Nickelodeon Slime Cup! What have been the stand out successes on Nickelodeon for 2017? Fuelled by local productions, tent pole events and world-leading pre-school properties, Nickelodeon Networks wrapped its financial year (October 2016 – September 2017) retaining the #1 position among children 0-12 for the second year in a row – which is a great result! A few of the biggest successes for us include the second season of Nickelodeon’s locally produced series SLIME CUP, which had an average audience increase of 36% from 2016, among the target demographic of children 5-12. Another stand out was our first ever Nickelodeon Kids’ Choice Sports Awards for Australia and New Zealand, simulcast on Nickelodeon and FOX SPORTS and ranking number one in its time slot for children 5-12. This project was particularly exciting because it was a six-week immersive entertainment experience across all screens, with local content featuring superstar athletes being distributed via the Nick Play app, online at nick.com.au, and on television, allowing kids to catch behind-the-scenes footage and stunts with their favourite sporting stars. Lastly, the Nick Jr. PAW Patrol Honorary Pup Squad is a great example of how we engaged existing audiences with exclusive stunts, competitions and content across the network. The eight week multi-platform stunt was tailored to suit a client’s needs, while leveraging this powerhouse franchise. The PAW Patrol page and its competition page were the top two pages on the website across the period, showing strong demand for multiplatform campaigns. What’s coming in 2018 across broadcast and digital? We’re excited that a lot of our key tent poles and local productions will be returning for 2018. 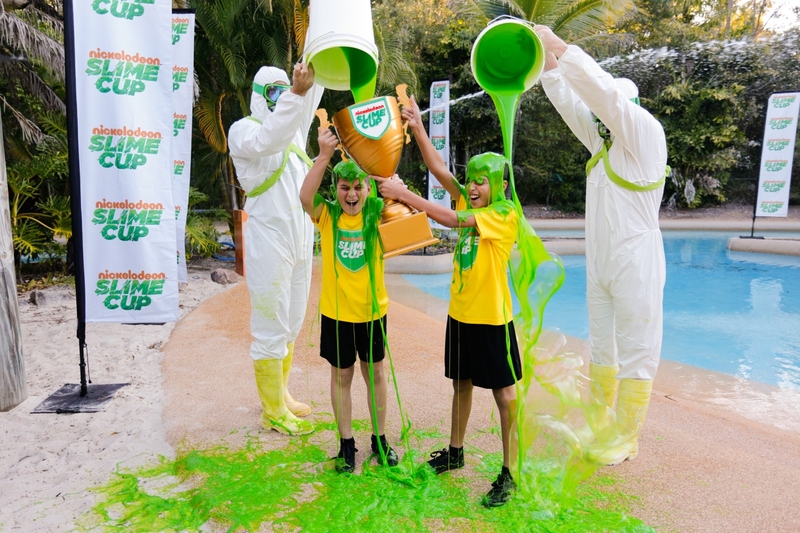 We’ll kick off the year with Crash the Bash, Kids’ Choice Awards express from the US in March and SLIME CUP on-ground auditions will follow before a premiere in June. We’re also expanding our local short form content with the launch of Nickelodeon digital content verticals. We’ll be bolstering Nick Sports making it the go-to location for kids who want entertaining sporting content or games. We’ll also focus on new digital offerings, the exploration of augmented reality and new technologies, that will help create impactful online experiences. Our mission is to continue to create the most talked about experiences of all time, so we will continue immersive on-ground activations surrounding our powerhouse content. From cinema activations, to publicity stunts and live events, this is will be a key focus for marketing efforts in the coming year. Tell us a bit more about Crash the Bash? Based upon a long history of connecting kids with the sports they love, Nickelodeon is creating more partnership opportunities with content production, promotions, prizing and activations on and off the field. We know sport is a passion point for Aussie kids and a great chance for brands to engage with thousands of people. We confirmed a second year of our partnership with Cricket Australia and the Big Bash League and in addition to ramping up our on-the-ground activations at matches across the country, we’ll also be doing a second season of the BBL and WBBL children’s television show aptly named Crash The Bash. Crash the Bash premieres on Nickelodeon just before Christmas and runs all the way through January. There are lots of sponsorship opportunities with the program and other Nickelodeon summer programming. For partnership opportunities with Nickelodeon please contact your MCN representative on 02 9209 6300. 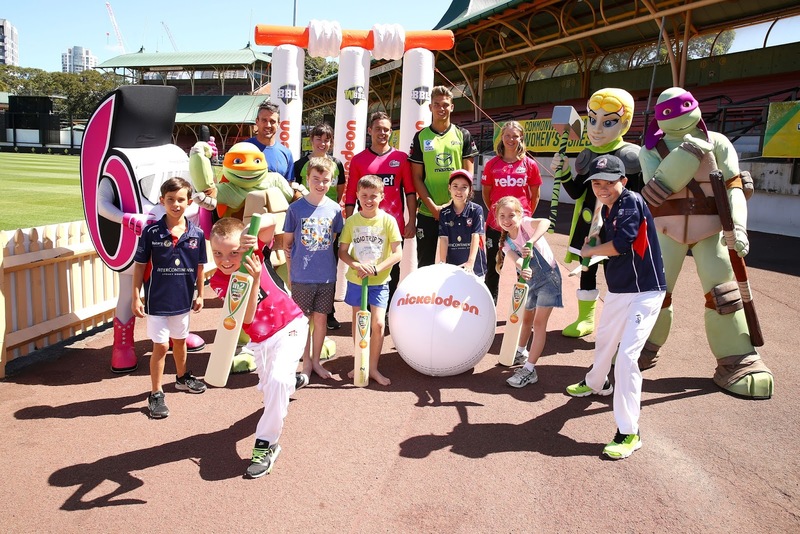 More Nick: KFC BBL Announces Renewed Partnership With Nickelodeon Australia For BBL|07! 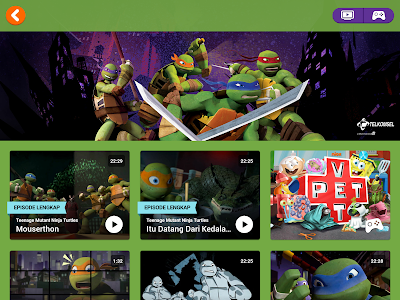 Indonesia, 30 November 2017 - Nickelodeon, together with its partner Telkomsel, leading operator of cellular telecommunications services, has launched the Emmy award-winning Nickelodeon Play app in Indonesia. Nickelodeon Play is a safe destination jam-packed with the best and funniest Nickelodeon content and is now available for free download from the App Store or Google Play. The first kids’ pack in the Telkomsel OTT stable, Telkomsel’s base of over 190 million mobile subscribers will be able to enjoy the complete Nickelodeon experience by subscribing to the VideoMAX NICKELODEON PLAY package. This offers a dedicated data plan for Nickelodeon Play, where fans can unlock premium content by selecting “VideoMAX NICKELODEON PLAY” via MyTelkomsel, or activate by dialing *363# through the Telkomsel mobile service menu. The app is available in Bahasa Indonesia or English, dependent on mobile device language settings. “We’re delighted to introduce Nickelodeon Play to fans in Indonesia, especially when viewers and in particular kids in Indonesia, are accessing a wide range of devices to view content. The immersive and interactive app is a great new way to experience Nickelodeon’s unique brand of funny, while allowing kids to re-discover the content they already love,” said Ms. Syahrizan Mansor, Vice President, Nickelodeon Asia, Viacom International Media Networks. Created for kids aged seven and above, and their parents and caregivers, users can look forward to regular new content, and unwind with non-stop humor and endless surprises. The content will include many full-length episodes, first and exclusive shows, short-form videos, games, and surprise elements from the network’s animated and live-action series. Access to exclusive content requires a subscription with an affordable price of Rp 29,000, bundled with a 1.5 GB VideoMax data pack. 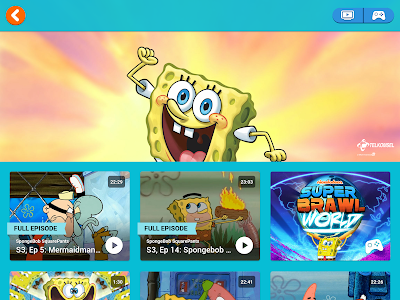 Free access to selected episodes and on-demand access to Nickelodeon’s popular series such as SpongeBob SquarePants, Teenage Mutant Ninja Turtles, Avatar: The Legend of Aang, and ALVINNN!!! and The Chipmunks. From action, to puzzle, to strategy game categories – fans can try various games such as Super Brawl World, Bikini Bottom Tic Tac Toe, and Block Party 3. The app promotes self-discovery as kids can uncover different things as they interact with the app anytime, anywhere. Check out the ‘Do Not Touch’ button for random surprises at your fingertips! In Asia, Nickelodeon Play was first launched in Singapore in 2016 and Indonesia is the second market in the region to launch it. 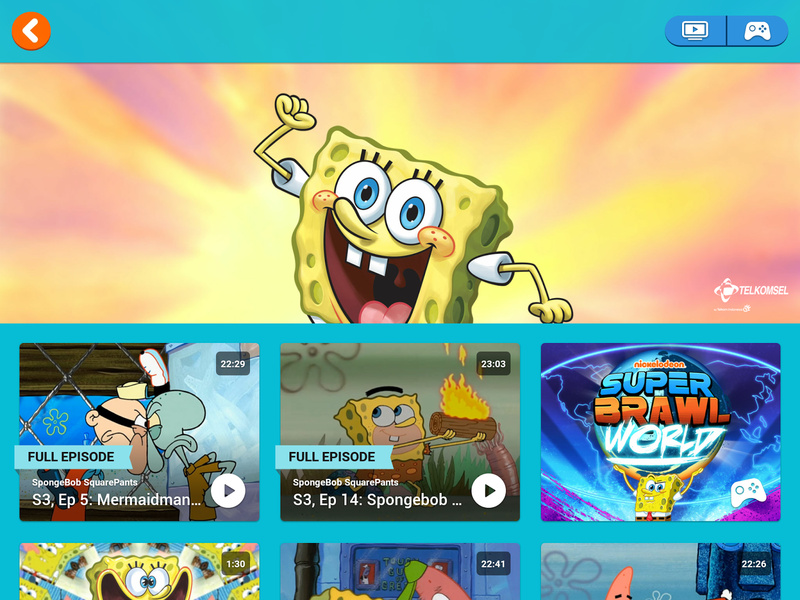 Nickelodeon Play is part of Viacom Play Plex, a suite of mobile apps for each of Viacom’s major international brands, offering video-on-demand (VOD) access to a range of current and library content, and other short-form, game and music video content. Telkomsel is Indonesia’s largest mobile operator with more than 190 million subscribers. To serve customers all over Indonesia, including in remote areas, outer islands and border areas, Telkomsel has built more than 152,000 BTSs. Telkomsel has consistently implemented technology roadmap of 3G, HSDPA, HSPA +, as well as being the first mobile operator in Indonesia to commercially launched the 4G LTE services. Entering digital era, Telkomsel has been continuously developing a wide range of digital business, such as Digital Advertising, Digital Lifestyle, Mobile Financial Services and Internet of Things. To serve the needs of customers, Telkomsel operates a 24-hour call center and GraPARI across Indonesia. Nickelodeon, now in its 38th year, is the leading entertainment brand for kids. It has built a diverse, global business by putting kids first in everything it does. The company includes television programming and production in the United States and around the world, plus special events, consumer products, digital, recreation, books and feature films. Nickelodeon's brands reach 1.2 billion cumulative subscribers in more than 170 countries and territories, via more than 100+ locally programmed channels and branded blocks. Outside of the United States, Nickelodeon is part of Viacom International Media Networks, a division of Viacom Inc. (NASDAQ: VIAB, VIA), one of the world’s leading creators of programming and content across all media platforms. For more information or artwork, visit http://www.nickpress.com. Nickelodeon and all related titles, characters and logos are trademarks of Viacom Inc. For more information about Nickelodeon in Asia, visit www.nick-asia.com. More Nick: Nickelodeon Asia Acquires Rights To Three Animated Shorts In Southeast Asia! Follow NickALive! on Twitter, Tumblr, Google+, via RSS, on Instagram, and/or Facebook for the latest Nickelodeon Asia and Nick Play News and Highlights! Check out Alyssa’s festive performance of 'Underneath the Tree' by Kelly Clarkson! Coming to you all the way from the North Pole, watch as Alyssa flies onto the Shortie’s stage on her very own sleigh! Catch more Lip Sync Battle Shorties Holiday Special Sunday December 3rd at 7pm ET/PT on Nick USA, and soon ! Following its US debut, Lip Sync Battle Shorties Holiday Special will then roll out on Nickelodeon channels and programming blocks globally soon after, including on Nick UK & Ireland on Monday 11th December 2017 at 5:00pm GMT; Nickelodeon Australia and New Zealand on Friday 8th December 2017 at 6pm (AEDT); and Nickelodeon Africa on Friday 22nd December 2017 at 07:30 CAT. Follow NickALive! on Twitter, Tumblr, Google+, via RSS, on Instagram, and/or Facebook for the latest Holidays on Nickelodeon and Lip Sync Battle Shorties News and Highlights! Fairly OddParents has been around OVER 15 years and is one of Nickelodeon's longest running animated series. Created by Butch Hartman, Fairly OddParents follows Timmy Turner as he gets every wish he ever wanted granted by his fairy godparents! After 10 season, multiple specials and even live action movies (yes! ), the series has changed quite a bit!! So Channel Frederator is bringing you Then VS. Now Fairly OddParents! More Nick: Fairly OddParents 10 Years Later | Butch Hartman! MYSTICONS | Choko Week! *chirp*; Top 5 Foz Facts | Sundays @ 8:30AM on Nickelodeon USA! MYSTICONS | Choko Week! *chirp* | Sundays @ 8:30AM on Nickelodeon! TOP 6 FOZ FACTS | MYSTICONS | Sundays @ 8:30AM on Nickelodeon! Follow the adventure online! : Mysticons.com, Nick.com/Mysticons | YouTube channel | Facebook | Twitter | Instagram! More Nick: Playmates Toys Introduces Its First Action Figure Collection for Girls, Based on Hit Animated Series 'Mysticons'! Así vivimos el detrás de escena del super FLASHMOB que hicieron los chicos de Kally´s Mashup. ¿Qué te pareció a ti? ¡Dile a Nick en YouTube! Más Nick: Nickelodeon Latinoamérica Premieres "Kally's MashUp"! Follow NickALive! on Twitter, Tumblr, Google+, via RSS, on Instagram, and/or Facebook for the latest Nickelodeon Latin America and Kally's Mashup News and Highlights! Summer (Jade Pettyjohn) learns that there is nothing better than being yourself in School of Rock's fantastic music video for "Just Be Who You Are", from episode "The Other Side of Summer"! Summer impara che non c'è niente di meglio che essere se stessa. Di Più Nickelodeon: Nickelodeon Italy To Premiere 'Welcome To The Wayne' On Wednesday 6th December 2017! Additional source: School of Rock Wiki. Follow NickALive! on Twitter, Tumblr, Google+, via RSS, on Instagram, and/or Facebook for all the latest Nickelodeon Italy and School of Rock News and Highlights! Песня Альберта для новогоднего настроения. Click here to watch the music video in English. Watch Albert this festive season, only on Nickelodeon and Nicktoons! Больше Nick: Nickelodeon Russia Celebrates 19th Anniversary On The Air! Follow NickALive! on Twitter, Tumblr, Google+, via RSS, on Instagram, and/or Facebook for the latest Christmas on Nickelodeon Russia and Albert News and Highlights! Lizzy Greene and Riele Downs stepped out in style for the red carpet premiere of their brand-new Nickelodeon holiday movie, Tiny Christmas, on Tuesday night (November 28) in Hollywood! The two actresses star as cousins in the upcoming film, who get shrunk by a clumsy elf on Christmas Eve, and they get scooped up into Santa’s sack. When they are dropped off across the street, the tiny kids have to navigate holiday hazards to make it home safely. I Am Frankie's Kyson Facer, Victoria Vida, School of Rock stars Ricardo Hurtado, Aidan Miner, and Breanna Yde, Knight Squad's Daniella Perkins, Lexi DiBenedetto, Armani Barrett, and Savannah May, and Fuller House’s Elias Harger also stepped for the premiere. Tiny Christmas will debut on TV on Saturday, December 2nd at 8:00pm ET/PT on Nickelodeon USA, and soon after on Nickelodeon channels and blocks around the world. Check out photos from the Nickelodeon's Hollywood premiere of Tiny Christmas here on Just Jared Jr.! To celebrate Nickelodeon USA premiering the brand-new SpongeBob SquarePants episode "The Incredible Shrinking Sponge"/"Pat the Horse" on Saturday 2nd December 2017 at 10:00am ET/PT, as part of Nick's Wishlist Weekend, Nick USA has unveiled a Sponge-Tastic sneak peek preview from the all-new episode, which you can watch in the super online streaming video clip here on Nick.com and on the Nick App! In the brand-new SpongeBob SquarePants episode "The Incredible Shrinking Sponge" (#212A), SpongeBob must figure out how to do his job after accidentally shrinking himself! Then, in "Pat the Horse" (#225B), Patrick wants to be a horse! 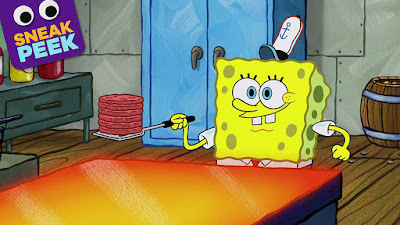 In Nick's fantastic sneak-peek, "Steamy Sponge", SpongeBob's grill is WAY too hot! Not only are his Krabby Patty's shrinking from the heat, but he steamed himself tiny! More Nick: Are You Ready Kids? SPONGEBOB SQUAREPANTS Musical Begins Broadway Previews; New Block Of Tickets Available! Additional sources: ToonZone Forums /@PinkiePie97, Zap2it TV Listings, TheFutonCritic.com. Follow NickALive! on Twitter, Tumblr, Google+, via RSS, on Instagram, and/or Facebook for the latest Holidays on Nickelodeon and SpongeBob SquarePants News and Highlights! To celebrate Nickelodeon USA premiering the brand-new The Loud House holiday special "Snow Way Out"/"Snow Way Down" on Friday 1st December 2017 at 7:30pm ET/PT, as part of Nick's Wishlist Weekend, Nick USA has unveiled a fantastic sneak peek preview of the all-new festive episode, which you can watch in the super video clip here on Nick.com and on the Nick App! In the brand-new The Loud House episode "Snow Way Out" (#226a), Lana convinces the children to go to the Burpin' Burger to meet her racecar driving hero, despite the heavy snowfall! Then, in "Snow Way Down" (#226b), when Lincoln goes on vacation with Clyde, he realizes how overprotective Clyde's parents are! 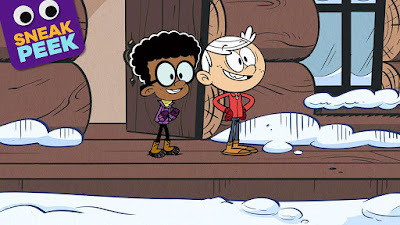 In Nick's super sneak-peek preview, "Winter Vacation", Clyde and Lincoln are EXCITED to play in the snow during winter vacation! But Clyde's Dad's really want to make sure they are safe and don't get hurt. The Loud House holiday special "Snow Way Out"/"Snow Way Down" will also be the second season finale of Nick's hit animated series. Following the episodes debut, Nick USA is slated to start to air The Loud House season three from early 2018. Additional source: The Loud House Encyclopedia. Follow NickALive! on Twitter, Tumblr, Google+, via RSS, on Instagram, and/or Facebook for the latest Holidays on Nickelodeon and The Loud House News and Highlights! Kid-E-Cats (52 x five-minute episodes) tells the story of three adorable kittens: Cookie, Pudding and their kid sister Candy, who are always ready to jump into action with endless enthusiasm and energy. Their imagination knows no bounds, and these kitties create absurdly funny suggestions to solve their problems. Through life’s little lessons, they learn to look before they leap -- well sometimes! In the first ever episode, "Musical Birthday Card", it’s Daddy’s birthday and the kittens want to give him a musical birthday card just like he’s always wanted. When they get carried away enjoying the music themselves they have to quickly think of another way to give Daddy his gift! Kid-E-Cats is based on an original Russian series produced by CTC Media and Studio Metranom/Metrafilms, which currently airs on CTC and Carousel in Russia. The English-language version is executive produced by former Zodiak Kids UK CEO Nigel Pickard, while Ceri Barnes (Floogals, Postman Pat, Casper’s Scare School, Guess with Jess) serves as story editor, and is working with the Russian writers and creators of the show Dmitriy Vysotsky and Andrey Sikorsky. The series launched at MIPCOM 2016. 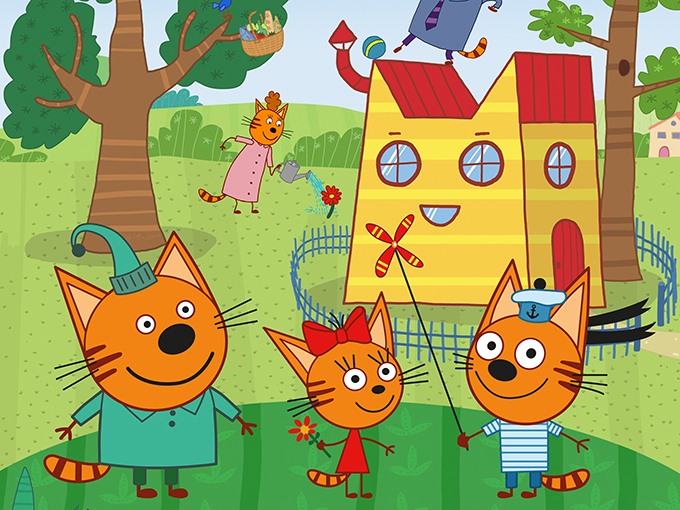 Nickelodeon International picked up the global broadcast rights to the first series from APC Kids, the children’s entertainment distribution arm of London-based boutique financier and distributor About Premium Content (APC) in September 2017, and will air on Nick Jr. channels in 143 countries, including the UK, Benelux, Germany, Switzerland, Austria, Greece, Indonesia, Vietnam, the Philippines, Australia, India, South Korea and Russia. 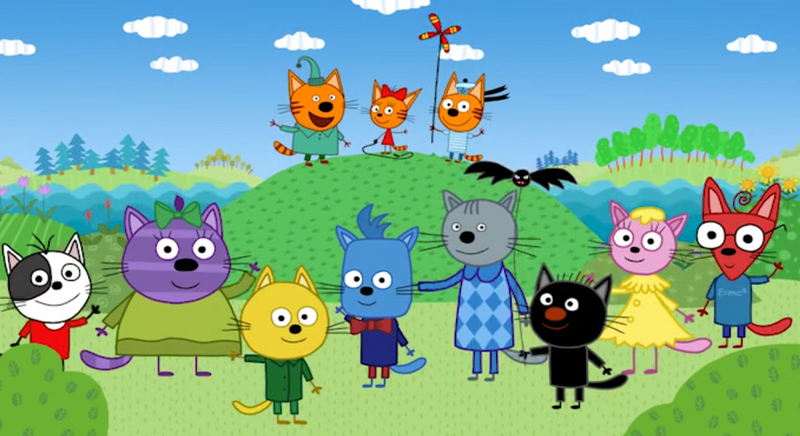 The Nick Jr. deal will see the toon reach more than 100 million international households. More Nick: Nickelodeon Germany, Austria & Switzerland To Premiere 'Sunny Day' On Monday 8th January 2018! Follow NickALive! on Twitter, Tumblr, Google+, via RSS, on Instagram, and/or Facebook for the latest Nickelodeon and Nick Jr. Germany News and Highlights! Tiny Christmas is coming your way this December! So to get you in the holiday spirit, check out an exclusive sneak peek scene from the tiny stars themselves, Lizzy Greene (Nicky, Ricky, Dicky & Dawn) and Riele Downs (Henry Danger)! Don't miss the new Nickelodeon Original Movie, Tiny Christmas, on December 2nd at 8:00pm ET/PT on Nick USA, and on Nickelodeon's international channels soon after! Perdeu a transmissão do MPN 2017? Corre que o show está disponível no Mundonick e Nick Play por tempo limitado! Mais Nick: Nickelodeon Brazil Announces 'Meus Prêmios Nick 2017' Winners! The young actor Ethan Slater has been involved in Nickelodeon's SpongeBob SquarePants stage musical since its very first workshop five years ago. But back then, he had no idea he was auditioning for the role of SpongeBob. On Stagecraft, Slater and his co-star Lilli Cooper, who plays the squirrel scientist Sandy Cheeks, talk about bringing the optimistic invertebrate to life onstage. In a separate conversation, director Landau and writer Kyle Jarrow explain how they came up with the show’s original storyline. “I like to describe it as ‘Armageddon’ meets ‘Our Town’ meets SpongeBob,” Jarrow jokes. Although the production is a big-budget musical, it has a homemade, found-object feel to it. 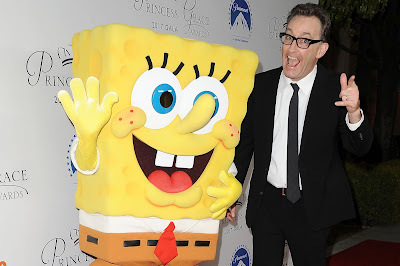 That was part of Landau’s concept from the beginning, who embraced SpongeBob creator Stephen Hillenburg’s indie aesthetic as she tried to figure out how to put a two-dimensional sponge onstage. Listen to Variety’s latest Stagecraft episode below, and download and subscribe to Stagecraft on iTunes, Google Play, Stitcher, and Soundcloud! Power Rangers | Ninja Steel Recap Part II!